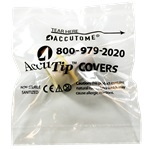 Each AccuTip cover is sleeved with a cardboard insert, sanitized and individually packaged. Comes in a box of 100. These AccuTips are for use with the AccuPen or Reichert TonoPen® handheld tonometers. 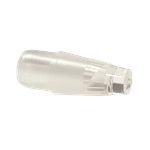 These tonometer tip covers can be used to keep your patients safe from a contaminated tonometer tip, thus helping prevent infection. 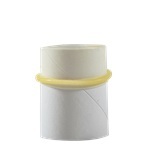 Each AccuTip cover is sleeved with a cardboard insert, sanitized and individually packaged. Comes in a box of 300. These AccuTips are for use with the AccuPen or Reichert TonoPen® handheld tonometers. These tonometer tip covers can be used to keep your patients safe from a contaminated tonometer tip, thus helping prevent infection. **THIS ITEM IS CURRENTLY ON BACKORDER. ** Comes in a bulk package of 600 covers and does not have cardboard inserts and are sanitized. These AccuTips are for use with the AccuPen or Reichert TonoPen® handheld tonometers. Covers are made from latex. Helps reduce the risk of patient infection from the tonometer tip. Covers come in bulk boxes and do not have cardboard inserts and are sanitized. 900 count, which comes as 150 covers per box and 6 boxes in bag. These AccuTips are for use with the AccuPen or Reichert TonoPen® handheld tonometers. Covers are made from latex. Helps reduce the risk of patient infection from the tonometer tip.